To understand women’s involvement in the Arab Spring generally and in Yemen specifically, we need to shift away from globalized media narratives influenced by imperial discourses of the likes of Mona Eltahawy and move toward local modes of knowledge production. Examining discourses of emancipation articulated by women in their localized context is necessary both to genuinely address women’s rights and move beyond liberal interventionism in the region. Nowhere is this truer than in Yemen, where decentralised politics makes it impossible to homogenize the experience and role of women in Yemen’s protest movement. 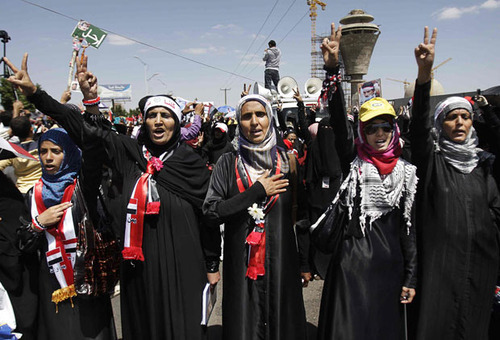 To understand the Yemeni revolution from a gendered perspective, one must begin by looking at the differing local dynamics, which affected women’s participation. In Tai’z, for instance, women were front and centre in street politics and civil disobedience strikes, using the shame associated with threatening or attacking women to protect protesters from violence. On the other hand, in the northern highlands of Sa’ada, where the Zaydi Houthi movement, and not the central government, has control, women were prohibited from demonstrating in the streets. Instead they conducted biweekly gatherings in schools and wrote anonymous letters to corrupt local council leaders. While women-only protests did exist, they occurred only when sanctioned and facilitated by the staunchly anti-regime, Houthi-run local authority. Many women jumped at the opportunity to attend these sessions both for political reasons and also because, for many, it was a rare chance to leave home for a social occasion. In Sana’a, where tribal customs hold great sway, hundreds of women set fire to their veils in protest, a symbolic gesture used to appeal to tribesmen for support in desperate times. In doing so, these women ensured that the local tribes would take ownership of, and not be threatened by, the revolution. In Aden, women navigated the complex politics of the city’s protest squares, where calls for revolution were intertwined with calls for secession. There, the Southern Issue—a set of political, social, economic, and historical grievances—formed the cornerstone of women’s calls for change. Women activists in the South have been frustrated with those in the North who dominate the discussions around ‘women’s rights’. According to a prominent woman activist in Aden, they “do not respect Southern women and the Southern Issue”. In each of these instances, women have demonstrated a remarkable ability to carve out spaces of resistance, defying harassment and utilizing small openings to make their voices heard. Amongst this diversity, one commonality has consistently emerged: women activists throughout the country have insisted on articulating their struggle for equal rights within a broader revolutionary discourse calling for a ‘modern, civic state’ with ‘justice’ and ‘equality’ for all Yemeni citizens, regardless of gender, religion or geography. This statement is simple, but subversive. Through this approach, women activists have placed themselves at the very centre of Yemen’s revolution, whose success now hinges upon the role these women will play in the coming years. Any regression in women’s rights will undoubtedly signal a failure of the revolution itself. This not only embeds women within Yemen’s revolution, but also ties feminist discourses to wider systems of oppression. This is where international, liberal feminist approaches have failed. One cannot disaggregate the status of women in Yemen from the wider structures of oppression that drove hundreds of thousands of Yemenis to the streets. To support the role of women in the post-Arab Spring landscape one must not shy away from addressing the wider structures of economic and political oppression, which are undoubtedly complex and inevitably political. By localising dissent and placing their calls for equality at the heart of the protest movement, women have also become targets. Violence against women during the Yemeni protests cannot be disentangled from wider counter-revolutionary objectives and attempts by more established forces to control, hijack, or weaken independent uprisings. It is, therefore, no surprise that, in order to weaken the protest movement, the Islah party, a broad coalition of Islamists, descended onto the squares and segregated the sexes. Women were prevented from protesting with men. In Sanaa, for instance, women were forced to sit in a separate yard inside the square, covered by heavy curtainsand locked behind a thick iron gate. While Islah members argued it was haram for men and women to mix publicly, this act also served to weaken and divide the protest movement that emerged in the first few months of 2011, and allowed Islah to control the squares. What better way to cut at the heart of calls for equality than by literally dividing the population in two under the false guise of religiosity? A bottom-up approach to understanding gender dynamics helps us challenge liberal internationalist feminism that obfuscates more than it reveals. Similarly, approaching local articulations of feminism within the wider context of resistance against broader political, military and economic oppression is also necessary to ensure that feminist objectives are embedded within broader calls for resistance. In the end, we may find that it is not the broad sweeping statements, but the small localised spaces of resistance that we need to be watching. *Saleem Haddad is a staff writer with Muftah. Posted on August 3, 2012, in Feminism, Middle East, Uncategorized and tagged Women's Rights, Yemen. Bookmark the permalink. Leave a comment.